Cracks in concrete floors can not only be unsightly but can also be dangerous and can cause trip hazards. Here at Promain we make sure that we sell only the very best concrete floor repair products that have been created to deal with cracks in concrete floors in the best way possible. As well as concrete floors these products can also be used on concrete stairs and stair edges to ensure a safe surface for any concrete flooring. Whether it is for internal or external use we are sure to have the perfect product to suit your specific needs. Our fantastic team of experts are always on hand to discuss the best product for you so if you have any queries or questions then make sure you give us a call as we would be more than happy to answer your questions and to point you in the direction of the best product for your needs. A professional quality fast setting and permanent repairs compound for badly cracked and worn concrete or stone floors. Rustoleum Pegacrete water based concrete repair for indoor and outdoor use. 5160 Flexible Joint Sealant for filling and sealing expansion joints and concrete bay joints in floors and screeds. For internal or external renovation of concrete floors, holes, cracks and damages. CSP Cold Room Repair Mortar works at temperatures as low as -35° Celsius. A cement-based, one component low permeability repair microconcrete, containing silica fume and polymer. A one component cementitious polymer modified mortar, suitable for interior and exterior use. A one component cement based polymer modified high build repair and reprofiling mortar. Versatile, fast repair mortar for repairing concrete in just a few hours. Fibre reinforced PCC dry mortar for the repair of concrete structures with static loads. Fast repair mortar for repairs in facade areas that are not statically or dynamically stressed. Additive for the production of a durable corrosion inhibiting coating made with Betofix RM or Betofix R2. Water-based primer for use as a bonding layer on old coatings and ceramic coverings. When painting a concrete floor, you need to ensure the preparation is of the highest quality. The existing coating will need to be removed, or identified, cleaned, abraded and degreased. Recently installed concrete floors will need to fully cure and preferably grit blasted to remove the laitance, for smaller projects, an acid etch treatment is a popular solution. In most cases, the first coat of floor paint is thinned to assist with impregnation into the concrete and allowed to dry, apply the second coat neat then allow the system to fully cure. Anti-slip aggregate can be sprinkled over the first coat, and then sealed in with the second coat to create a slip resistant surface. Use of a double armed roller frame holds the roller at both ends, and allows equal pressure across the width of the roller. Using a paint scuttle allows you to cover the entire surface of the roller and helps to avoid a patchy finish once the second coat has been applied. Often, the first coat can appear patchy due to varying porosity of the substrate, so don’t worry at this stage. It is important that the paint is left to fully cure before it is trafficked, otherwise unwanted scratches can occur. 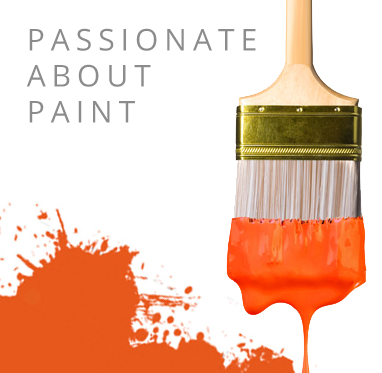 You will need to choose an appropriate paint for the type of surface and environment. For a workshop where there is foot traffic and storage etc. Rustoleum 7100 is an easy to use product and can also be applied to wooden floors. This is also available in a pre-mixed anti-slip version for enhanced slip resistance for designated walkways etc. Used on bare wood or clean concrete more than two years old, simply thin the first coat with 10% white spirit and apply the second coat neat. This product can be applied over most existing floor coatings, however, a trial area is recommended to ensure compatibility. For an industrial warehouse storing food items and where fork lift and palette trucks are used, Rust-Oleum Pegakote two pack water based epoxy is a good choice. Offering a semi-gloss appearance, this product offers excellent abrasion resistance, chemical resistance and low odour. The hardener is mixed in with the paint and paddle mixed together prior to application. This initiates a chemical reaction where the paint cures and becomes very hard wearing, reaching full chemical resistance after 1 week. The standard range of colours are readily available, but we have the ability to tint to a wider range of colours if required. This product will need to be applied to grit blasted concrete, or the use of Rust-oleum 108 Surfa-Etch for smaller jobs, where you will need to rinse the floor abundantly with water and allow to dry. Thorough rinsing avoids creating an acidic concrete, which can damage the paint. External areas subject to light foot traffic can be given an anti-slip coating such as Coo-Var Suregrip, but you may need a primer depending on what surface is being painted. For wood, use the Coo-Var P224 Wood Primer. If you are painting onto concrete, use the Coo-Var G136 Floor Paint thinned with white spirit, followed by two coats of Coo-Var Suregrip. To ensure an even distribution of anti-slip aggregate, stir the paint before and during application, otherwise it can sink to the bottom of the tin. At colder times of the year, PPG's SigmaCover 640LTNS offers curing at low temperatures and provides non slip surfaces for external concrete and metal surfaces, which often need maintaining in the winter months. This product is surface tolerant, meaning that manual preparation is sufficient in order for this product to adhere; oil and loose material will still need to be removed however. Promain have an excellent range of construction and repair products that are completely ideal for any repair tasks you may have on either internal or external concrete areas. We have a wide range of products that are perfect for epoxy repair and self levelling mortars as well as joint sealers that are perfect for concrete flooring. We make sure that the products we sell are the best prices possible to ensure that you are not only getting a quality product but you are also getting great value for money. If you are looking for concrete floor repair materials then make sure you take a look at the extensive range of interior and exterior concrete floor repair products that we have available here at Promain, all of which have been sourced from only the very best manufacturers of such products to ensure complete customer satisfaction.